Built by Associated Architects for the Manitoba Centennial Centre (Green Blankstein Russell; Moody Moore and Partners; Smith Carter Searle and Associates). Opened 1968. 2305 seats. Home to the Winnipeg Symphony Orchestra, Royal Winnipeg Ballet and Manitoba Opera. 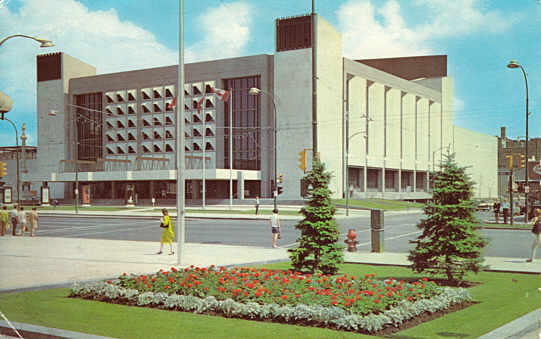 Reverse Text: "Centennial Concert Hall, Winnipeg, Canada. The Concert Hall is part of a complex embracing a Planetarium and Museum, erected to commemorate Manitoba's Centennial Year." 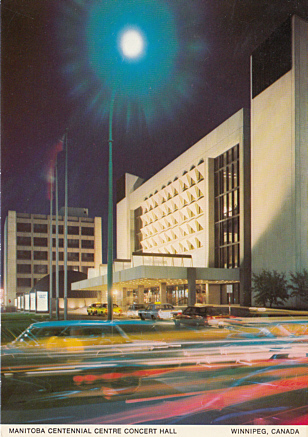 Front Text: "Manitoba Centennial Centre Concert Hall - Winnipeg, Canada"
Reverse Text: "Night heightens the excitment of attending a performance at the Concert Hall, which has achieved an international reputation for its acoustical excellence. Sellout crowds enjoy a great variety of cultural and entertaining performances including those of the Winnipeg Symphony Orchestra and world-acclaimed Royal Winnipeg Ballet. None of the 2263 seats in the auditorium is more than 116 feet from the stage. - Une soirée à la salle de concert est toujours un plaisir, et l'acoustique excellente de cette salle lui a méritée une réputation international. L'orchhestre symphonique de Winnipeg, le ballet royal de Winnipeg ainsi qu'une grande variété de présentations, jouent à salle comble. Aucun des 2263 sièges n'est à plus de 116 pieds de la scène."